I had the pleasure of talking with my two favorite New Jerseyans tonight about their thoughts on the gubernatorial race in the Garden state. Both are politically knowledgeable and extremely independent thinkers who spend five to six months out of the year out of the state taking in the rest of our beautiful country. If I had to guess -- and they certainly aren't terribly up front about this -- one is a Democratic leaner and the other is a Republican leaner. And that's if I was forced to guess. Needless to say, I was excited to have the opportunity to speak with them once I found out they were passing through on their way home to vote on Tuesday. Sure, it is nice to look at poll numbers -- representative ones at that -- but the chance for a two respondent poll was too much to pass up. The results? Bad news for Corzine. The money quote? "We're going home to vote; not to vote for someone, but to vote against someone." President Obama was efficient at "banking" early votes a year ago. A year later, Jon Corzine, the incumbent Democrat Obama is trying to pull over the finish line in this race, has a couple of unbanked votes trekking the final leg of their yearly odyssey across the United States coming home to the Garden state. No, my friends aren't necessarily the bellwether that a state like Missouri has been on the presidential level, but they are a pair of what Tom Jensen at Public Policy Polling has identified as grudging voters; arguably the face of this election on Tuesday. What does any of this mean? Everything and nothing in the close race that is being depicted in the representative samples that are being polled about this contest. The race for governor is still one that finds the two major party candidates consistently within the margin of error of each other. The two surveys from Rasmussen (no net change from earlier in the week) and Stockton/Zogby didn't stray from that pattern. 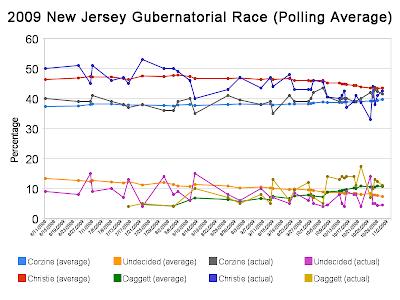 The former found Republican Chris Christie ahead by a handful of points while the latter (the first poll from this collaboration statewide in this race) found Corzine up a point. And independent Chris Daggett? Well, he's still the wild card. No, the former Republican is not likely to win on Tuesday, but he and those grudging voters will go a long way toward deciding who will eventually win on November 3. Daggett has leveled off in FHQ's averages of this race (between the 10 and 11 point range). Meanwhile the margin between Corzine and Christie continues to shrink. Christie is still ahead, but that lead is under 3 points now. And incidentally, I think I've got a couple of Daggett voters staying with me tonight. The news in Virginia didn't change all that much on Friday. In fact, it didn't change at all. The Daily Kos/Research 2000 numbers were leaked on Thursday, and according to the time stamp, we're up on Thursday as well (at some point), but when FHQ went to (virtual) press, they had yet to be posted. No, that isn't a huge deal, but we cannot incorporate a new poll in to our averages until the time frame in which the poll was conducted has been determined. Without that the poll cannot be properly weighted. Regardless, the underlying message was still the same. Despite the fact that Creigh Deeds topped the 43% mark (for just the third time in all of October), Republican Bob McDonnell still led, and led by double digits. 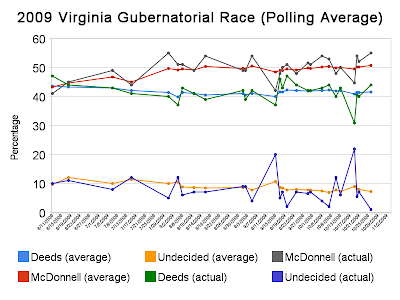 Deeds did have an over two to one advantage over McDonnell in Northern Virginia and narrowly edged the former attorney general among women, but those figures were easily offset by how well McDonnell is doing in this poll in the rest of the state (outside Northern Virginia -- a nearly two to one lead) and among men (a three to two advantage). The one stat that continues to give McDonnell much of his cushion is how well the Republican is doing among independents in the Old Dominion. That effect is muted in the Kos survey results compared to other recent polls, but is still high enough for McDonnell to maintain a healthy lead over his Democratic opponent (18 points). What does that mean for this race? Not much. Well, it doesn't mean anything more than we already knew. 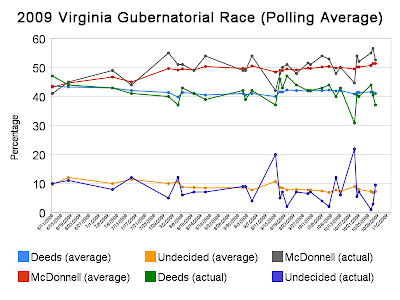 Bob McDonnell holds a decided and comfortable margin over Deeds heading into Tuesday's election, and it would take a significant upswing in Deeds' likely turnout numbers and a severe bout of complacency among McDonnell supporters for this one to be anything but a McDonnell win. The true test in this race won't likely be when the race is called so much as how quickly. Earlier this week President Obama signed into law the Military and Overseas Voter Empowerment (MOVE) Act. FHQ has commented on this piece of legislation a few times already (see here, here and here), but it never hurts to reiterate the highlights. The main product of this bill (now law) is that states with primaries set too close to the general election (less than 45 days before) are now faced with having to accommodate military personnel and others overseas. That has the effect of either forcing states to shift their primaries to earlier dates in order to comply or to submit a waiver request. Now that MOVE has been signed into law, the real work will begin. There are over a dozen states that that are affected. And it is more than just September primary states (see first link above for September primary states affected) that are affected. Obviously primary election certification takes time (see Florida 2000 in the presidential election for an extraordinary example) and that makes some August primary states like Colorado and Washington vulnerable to this new law as well. Of course, with more states affected comes a variety of responses to what is required. "You can’t print a ballot until you know who won,” said Minnesota Secretary of State Mark Ritchie, who is urging his state’s lawmakers to shift the Sept. 14 primary by at least a month. “And you can’t print ballots in five seconds. It takes several days to print a ballot. Then you have to put them in the mail." "Old habits die hard and a September primary certainly is our tradition,” [Vermont Secretary of State, Deb] Markowitz said. “I strongly believe that if we made a change to August, politicians would adapt, voters would adapt." “Our system of allowing people to delay voting until closer to Election Day is better in terms of making an informed choice,” [Washington state election official Katie] Blinn said. “Things just don’t get going here until September,” said [Wisconsin Board of Elections spokesman, Reid] Magney. Washington and other states may have a good argument for a waiver based on the fact that they accept and count overseas ballots a few weeks after the actual election date. The Evergreen state may have to expand that some. But the guidelines behind which states are granted waivers is still undecided. The folks running the Federal Voting Assistance Program will work in consultation with the US Attorney General's office to decide which states, if any, will be allowed an exemption. The vacation argument from Wisconsin is a valid one, but is a bit thin consider many of these same states have presidential primaries in the dead of winter when weather may be preventing voters from getting to the polls. Most states, however, will likely do what Nevada did (independent of this law change) earlier this year: move their late summer and fall primaries to earlier dates. Hat tip to Ballot Access News for the link to the reactions story. Those differences aside, this race is much closer than it was when the temperatures were hotter outside. You don't have to look much further than the three new polls released today to see that. But the race is so close, in fact, that people are starting to take note of things like the difference between the method in which polls are conducted -- via live interview or an automated phone call. FHQ mentioned this yesterday and Nate Silver has added his two cents on the matter today. I'm not trying to say I was on top of this first. I wasn't. Jim Geraghrty pointed it out first. Regardless, if you look at the chart at FiveThirtyEight you'll see that Corzine does well in live interview polls and Christie fares best in the automated surveys. Given FHQ's averages at the outset of the post, it is pretty easy to see that, at least statistically, we come down on the side of the automated polls. Our numbers reflect that side more. But that may be more a function of the fact that those polls have been more prevalent throughout the year (Those three polling firms alone make up about a third of the total number of polls conducted since the first of the year.). If you take the FiveThirtyEight data for what it is on the surface, we can look at the averages across the two types of polls and call it a tie; at least a race within the margin of error. And that's likely where this one is headed on election day. For now, though, we grade Christie as slightly ahead of Corzine with the margin continuing to shrink. The race for governor in Virginia is a lot like Michigan in last year's presidential race after the McCain campaign decided to cut their losses and spend their time and money in other states: It isn't any fun when it isn't competitive. Sure, there was some hope that we'd be treated to a close race when the thesis news broke and sunk in about a week or so later. That, though, came a bit too early for Deeds and ended up being a false front anyway. The thesis contributed to this to some degree in that it sidetracked the Deeds campaign for a while, but they never developed a tight message around and/or beyond that one thing to sustain them. So when the thesis effect wore off, Deeds didn't have anything to fall back on. Such is life on the campaign trail. Despite the fact that we know there is a Daily Kos/Research 2000 poll floating around out there, FHQ cannot incorporate it into the averages in this race without the full information of the poll. Mainly, without the date the poll was conducted, we can't construct the weight that would be applied to it. When that information is made available we will update the averages accordingly. In that poll's absence, however, there was but one survey released today. Roanoke College, like many other recent polls, found Bob McDonnell topping the 55% mark; the fourth poll of the last five to have him at or above that level (And the fifth found him at 54%.). While McDonnell is heading up, Deeds is heading down. Well, his decrease doesn't appear to be at as high a rate as McDonnell's increase, so it basically looks as if the Democrat is leveling out and shifting downward slightly. Again, that really isn't a position you want to be in during the final week of the race. Adding in this one poll shifts McDonnell up to 51.4%, a new high water mark for the former attorney general of the Commonwealth, but also moves Deeds down below 41% for the first time since FHQ began examining this race. Where does that leave us? Well, the state of this race is red and not competitive. Once perceptions are formed, they are difficult to break. And we all know how Quayle 2000 turned out. He didn't make it to Iowa. Will Palin? Incidentally, Jonathan Bernstein over at A Plain Blog About Politics has an interesting take on how Palin fits into the 2012 field; like an issue candidate (a la Kucinich or Paul) but with a much bigger following. I aptly, in my opinion, draws a parallel between her and Jesse Jackson's run in 1984. It's an good read; check it out. FHQ is going to go with a Twitter-like, quickie post of the events of the day in both Virginia and New Jersey. Like in Virginia, the polling in New Jersey maintained the status quo in this race. There was an interesting discussion about the difference between polls based on live interviews or a recording over the phone. Phone polls are showing Christie ahead. Interviews favor Corzine. Still, this poll represents a six point gain for Corzine over the last Quinnipiac poll two weeks ago. Unlike yesterday's PPP poll though, this one showed Daggett supporters opting for Christie over Corzine by a 43-27 count. The PPP count of Daggett supporters found Corzine had the advantage 44-32. Again, there's a difference in poll type there. As I said, this one merely maintained the state of the race from a day ago. Here at FHQ that means Christie is slightly ahead. That pretty much sums it up in Virginia. The day after Obama rallied with Deeds, the talk from the Republicans concerned complacency. Ouch! VCU's poll is its first in the race. The undecideds are higher than would be expected, but McDonnell's total seems about right. That 33% for Deeds is off, but it wasn't the most recent poll and didn't affect the averages that much. This Rasmussen poll is akin to the PPP survey a day ago. This one's gone from "feeling" like a 52-45 race recently to a 55-44 race now. FHQ's averages didn't shift that much. McDonnell held steady and Deeds shifted downward slightly. We'll see what tomorrow brings. 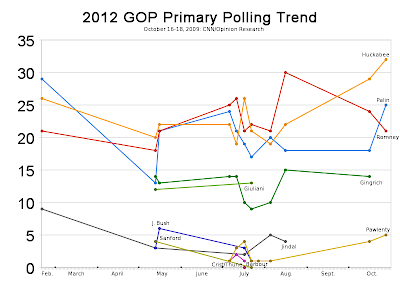 New Addition: FHQ has also now made it easier for you to track the evolution of the 2012 Republican primary trendlines you see below. Just click here or on the link below the latest 2012 update on the left sidebar to see the posts dealing with each of the eleven surveys released thus far. 1) Mike Huckabee is the first candidate to top 30% in any of these polls thus far. On top of that, the former Arkansas governor is close to pulling in a third of the (Republican) survey respondents' support and is the most favorable among all respondents. 2) Sarah Palin is the next most favorable, but is also the most unfavorable with over half of all the respondents leaning toward the latter. It would have been nice to have seen the favorables split by party. Still, Palin does the best in this primary poll (25%) as she has done in any such poll since stepping down from the Alaska governorship in late July. 3) Finally, Mitt Romney falls back for the second consecutive poll, but remains the least favorable/unfavorable candidate outside of Tim Pawlenty (a function of nearly half the respondents not knowing who the Minnesota governor is). And FHQ was going to write Palin off as being a part of that top tier of candidates. While Virginia is quickly being supplanted by the three way race in New York's 23rd congressional district in terms of competitive interest, New Jersey is not; buoyed by a three way race of its own. Of course, things were seemingly back to normal on Tuesday, a day after a Suffolk poll found incumbent, Jon Corzine ahead by an unseen-to-that-point 9 point advantage over Republican Chris Christie. Today, though, it was back to the within the margin of error polling leads that have marked this race in the Garden state for the last few weeks. Both Rasmussen and Public Policy Polling found as much in the state, though PPP's margin between the two major party candidates was technically outside of the margin of error. Still, both polls found Christie to be slightly ahead. The PPP survey is much more in line with where you no doubt see FHQ has the race pegged currently. Rasmussen, on the other hand, has a much more optimistic view of both the Democrat's and the Republican's position in the race, seemingly at the expense of independent, Chris Daggett. That is the real difference here: that Daggett has twice as much support in the PPP poll than in the Rasmussen one. Of course, the PPP survey also found that Daggett's unfavorables are rising and that he is more likely to hurt Corzine than Christie. 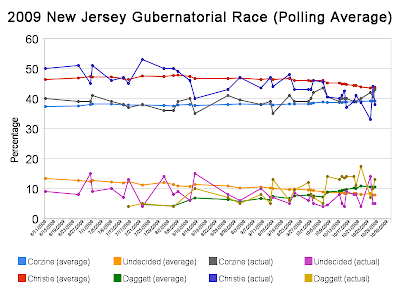 44% of Daggett supporters called Corzine their second choice to only 32% for Christie. The independent continues to play the wildcard in this race. Christie, however, maintains the advantage. The Republican actually gained a bit today (a function of the fact that yesterday's 33% in the Suffolk poll was replaced by the Rasmussen 46% as the most recent, fully weighted survey). Corzine, meanwhile, held steady. Another day brought another couple of polls in the Virginia governors race showing Bob McDonnell pulling away from Creigh Deeds. It was not the kind of day Deeds otherwise would have wanted considering that the president was coming in to campaign with the Democrat. The McDonnell campaign has to feel good knowing that even despite Obama's appearance in the Old Dominion, much of the talk surrounding the day's polls centered on comments like, "It basically seems like Democratic voters in Va. are giving up on this election." That's never a good sign coming from a pollster. Yet, such was the dichotomy of the day in Virginia. Bob McDonnell didn't gain that much in either the Survey USA poll or the Public Policy Polling survey, but Deeds didn't either. Well, in spite of the talk about landslides surrounding the Survey USA result, Deeds did actually fare better in this week's Survey USA poll versus last week's. But that's a small consolation to the Democrat. Meanwhile, in FHQ's averages, McDonnell has stretch his lead into the double digits; something that seemed to be on the verge of happening these last couple of weeks, but had yet to come to fruition. With one week to go, that's pretty much all she wrote in Virginia. When candidates turn off the flow of money for buying ad time, it is a pretty good indication. One thing that was made clear at this past weekend's Democratic Change Commission meeting was that the group's final recommendation to the DNC Rules and Bylaws Committee would heed the call of the convention provision that created the group in the first place. 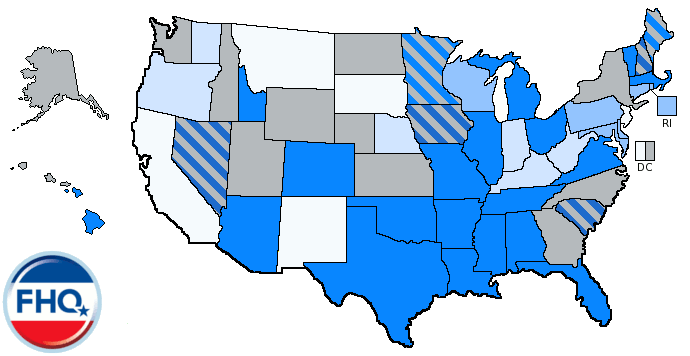 Namely, in regards to the timing of presidential primaries in 2012, the DCC is committed to closing the window on February delegate selection events (with the exception of Iowa, New Hampshire, Nevada and South Carolina). But the March 1 mandate is problematic for the very same reasons that make reforming the presidential process difficult: that the lack of a bipartisan approach hampers the entire effort at reform. And without bipartisan action to confront the reform process, there could potentially be several classes of states. The first distinction to be made is between states that have to move the date on which their delegate selection events are held and those that don't have to do anything to reach compliance. Well, there were a lot of February states in 2008. Secondly, there is a line that separates caucus states and primary states on this as well. The dates on which caucuses are held are determined by the state parties more often than not, while state governments (state legislatures and governors) set primary dates. State party compliance is easier to come by than state legislative compliance (see here for more on this point.). On a level that is more troublesome, however, is where the March 1 mandate intersects with state governmental action. 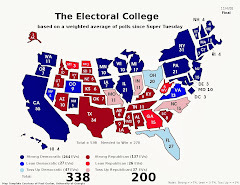 In states where the Democratic Party is in control of the state government, there may be some difficulty getting legislation altering the date on which any state's primary is held, but it would likely be minor compared to the potential resistance faced in states where the Republican Party controls both the executive and legislative branches. Again, all this assumes that the GOP does nothing to significantly alter the rules governing their delegate selection process. Yes, the party took the unprecedented step of creating a group (the Temporary Delegate Selection Committee) to look at those rules outside of the convention for the first time. Now, the party could opt to stick with the frontloaded system as a means of settling the 2012 nomination quickly in order to prepare for a long general election campaign against Obama. They could also radically alter the primary process in a way that exceeds what the Democratic Change Commission is charged with examining. In either scenario, a go-it-alone strategy by either party likely nets them both a situation where there is a partisan discrepancy in some states. In other words, some states may have no incentive to go along with one of the parties' rules. That's how we get back to the battle lines outlined above. Let's key in on that last one for the moment because that is where this gets Florida/Michigan messy. For the moment, let's assume that there are only minor changes to the Republican rules, that the Democrats go forward with this March 1 mandate for all non-exempt states, and that the GOP continues to allow February primaries and caucuses (Keep in mind Hawaii Republicans have already staked a claim to February 21, 2012 as the date for their caucus.). How many states have or will potentially have unified Republican control of the state government and could completely ignore Democratic rules (in the way that the Florida state government did a year ago)? Three isn't that many. Again, it isn't, but what's missing is states where there is a unified Republican legislature and a Democratic governor. The governor in those states can't make the state legislature pass a law just to comply with another party's rules. That adds three more states: Missouri, Tennessee and Oklahoma. Of course, those latter two may very well have Republican governors after the 2010 elections. Democrats in Tennessee and Oklahoma have very little depth on the bench behind either Bredesen in Tennessee or Henry in Oklahoma. Now, we've already potentially tripled the Florida and Michigan problem from 2008. But what about early states with legislatures that have two chambers split between the two parties. One chamber (the Democratic one) may want to push a bill through that would bring the state's primary within the Democratic delegate selection rules, but the other chamber may find some better use of their legislative time. Well, that nets us two more states, Michigan and Virginia. That would present the Democratic Party with a real dilemma. Eight states would potentially be in violation of the party's 2012 rules (specifically the March 1 mandate) through no fault of their own. Either legislative gridlock or unified Republican control of the state government could prevent compliance. How do you penalize states in that scenario? Would the state parties be forced to foot the bill for a party-run primary or caucus? It is just this sort of exercise that the Democratic Change Commission should be considering. There have been a number of questions in both meetings thus far along the lines of "is coordination with the RNC possible?" that give a sense of detachment. Both parties are set to nail down the 2012 rules next year and yet there is no apparent effort at coordination taking place (at least not at the level of the Temporary Delegate Selection Committee or the Change Commission) despite the very real possibility that problems like those described above could take place. It was Suffolk's first poll in the state for this race. The sample size is on the small end; only 400 people. There were a lot of undecideds (14%). The last time there was anything in the double digits for undecideds was the September 9 Rasmussen release (10%). Let me add some context: that was "You Lie!" week. Being that it was Suffolk's first poll in the race, they may have committed a grave error; weighting party identification to party registration. That's a no-no in New Jersey with unaffiliated registration. Is the poll something to be dismissed? No, but it should certainly be treated as an outlier. At one end of the spectrum (an extreme application of the margin of error), if Corzine cedes five points to Christie, the Republican has a one point edge. If you were to do Monte Carlo simulations given the data in this poll, that particular outcome wouldn't come up very many times though. In FHQ's opinion, though, there is one saving grace to this survey: the Daggett result. Sure, perhaps that number should be written off as an outlier given the independent's polling numbers of late. But I think there's something to this and we all should have been tipped off to the possibility a few weeks ago when Fairleigh Dickinson released a poll with a split sample where Daggett's name was used against Corzine and Christie with one subsample and Gary Steele, another candidate for governor, was used in the other subsample. I was too busy that day bemoaning the fact that we couldn't really trust the results of such a small subsample. All the while, though, there was an interesting trend underlying that poll and now this Suffolk one: Daggett has been afforded a privileged position in most of the polls in which he has been included. The independent has been the only non-Corzine/Christie candidate to appear in many of these polls and as such has been adopted by disaffected survey respondents as the anti-Corzine/Christie; a refuge for all wanting to avoid casting a ballot for either of the two major party candidates. When other third party names are included Daggett's support slips. Sure, he bested Gary Steele when the two subsamples of that Fairleigh Dickinson poll were compared, but the fact that Steele got over 10% was indicative of the fact that there was a fairly sizable portion of the likely electorate that did not particularly care for either Corzine or Christie. In today's Suffolk poll, all 12 gubernatorial candidates that will appear on the ballot next Tuesday were named. Again, Daggett lost his position as the only Corzine/Christie alternative and was knocked down to earth to some extent because of it. FHQ has already discussed Daggett's ballot problem and this poll may have picked up on what Daggett faces in the ballot box next week: that instead of one alternative to Corzine and Christie, there are several. Daggett's problem now appears to be that survey respondents recognized in him an alternative to Corzine and Christie and didn't necessarily recognize him. We won't know one way or the other until next week or until we get some more data along these lines (with hopefully a bigger sample). But what about the top two contenders vying for a chance to call Drumthwacket their home for the next four years? I don't think that it comes as a surprise to anyone that posting a 33 in this poll negatively affected Chris Christie's average. It did. In fact, it brought the former US attorney's average closer to the 43% mark; again uncharted territory. Meanwhile, Corzine inched ever so slightly further up, but the incumbent Democrat still pretty much sits on the 39% line. So, while Christie maintains a four point lead here, that is shrinking quickly. That's because he is doing far more falling than Corzine is jumping, though. 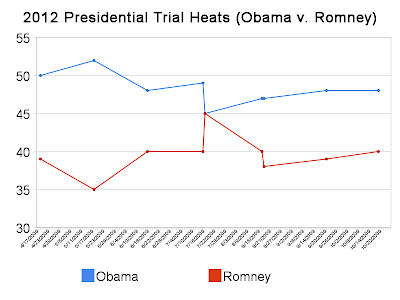 New 2012 Presidential General Election Trendlines. Now Time Adjusted! Today continued a string of poor days for Democratic gubernatorial candidate Creigh Deeds. It was a day that not only saw his opponent's campaign, Republican Bob McDonnell, hand over $25,000 to the Republican running for attorney general in the state, but also saw a continuation of the back and forth between national Democrats and the Deeds campaign over President Obama's involvement in the race. And if that wasn't enough, the Washington Post late in the day released another poll in the race showing basically no change in a 53-44 lead McDonnell held over the Democrat two and a half weeks ago. And it doesn't look like tomorrow's news is going to be any brighter for Deeds. What the news, well the numbers behind the news at least, mean is that McDonnell is looking like a pretty good bet in next Tuesday's vote. And that's a good pick up for the Republicans given how Virginia has trended at the national level in the last two cycles (two Democratic senators in 2006 and 2008 and 13 electoral votes for Obama last year). Given that it looks like Democratic turnout is going to be low, it seems a near certainty that Republicans will make gains in the other down-ballot races as well. That's especially significant in the year ahead of the Census and a potential redraw of the districts in the Commonwealth. The Democrats narrow lead in the Virginia Senate seems vulnerable and that would mean complete Republican control of the redistricting apparatus in the Old Dominion. That won't have direct implications for next year (Democratic turnout could be down again, though. ), but in 2012? Well, that's a different story. Meanwhile, in FHQ's averages in this race, Bob McDonnell is approaching a double digit lead, and it doesn't appear as if he's going to look back. Q: what is the situation about states having separate state & presidential primaries? Ie – California did it. A: expensive – but sense that California being so late is problematic. Last time California went early and they still didn’t get the attention. Very unsatisfactory then. State legislature seems to like moving it up. However, remember that incumbents benefit with an early primary ‘cause challengers haven’t been able to raise money and awareness and these positions are often chosen in the primaries. Q: How would budget deficit in California affect 2012? Q: states with federal and state primaries on the same day? A: most are together – but will find out exact number. In fact, this is very wrong. By my count, the 2008 primary calendar saw just 13 states with presidential primaries and primaries for state and local offices held concurrently. The remaining states and territories had their presidential nomination contests separate from their statewide and local primaries. And I say nomination contests there because 24 of the remaining 37 states held two separate primaries while the remaining 13 held caucuses for presidential delegate selection and later primaries for the other offices. Together at Last, or Are They? Here's the thing: This idea -- split primaries, as I've called them -- is the number one reason why some states have moved in the time since the McGovern-Fraser reforms that were instituted in 1972 and others have not. In the 1976-1996 period, presidential primary states that already had separate primaries were over five times more likely to move their contests to an earlier date than were those with concurrent presidential and state/local primaries. Once you add the cycles of the hyper-frontloaded era (2000-2008) -- when the incentive, like in 2008, was to move or get left out -- that effect dropped to only twice as likely. And no, that doesn't even take into account the caucus states. With those split caucus states included the effect is even greater. Well, those states that have already severed the tie between the two primary types, and have institutionalized the resulting structure over successive presidential election cycles, don't face the same problem states with concurrent primaries have. Concurrent primary states face the start-up costs associated with funding an all new presidential primary election (see constant reference to California's expensive transition in 2008 in the quoted text above). The split primary states have already dealt with and absorbed that cost. Those states, then, are much freer to move their delegate selection events where they please. And since about 1980, the motivation has been to frontload. So, do more states hold all their primaries together? No, they do not. Two-thirds of the country, in fact, hold separate contests. *The data for the years prior to 2000 were gather from various sources by the author, but from 2000 onward were thankfully publicly available on The Green Papers. **Texas could also fall into the caucus category simply because of its hybrid prima-caucus system. ***Arkansas was split for 2008, but has already passed legislation that will eliminate the separate primary in 2012. 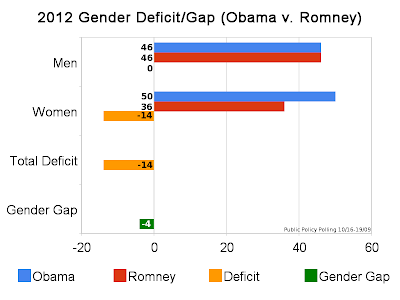 Gender Gap or Gender Deficit in 2012? Commission member, Suzi LeVine, once again has provided us all with what she called in an email to me her "copious notes" on the events that transpired at the two part meeting a day ago. Copious indeed. Still the best firsthand account of what is going on in these meetings. Check it out and I'll be back later with some broader comments on what transpired. Frank Leone over at DemRulz is on the scene in Washington and has a rundown of the morning half of the Change Commission's meeting. The group picked up with what they were to have addressed during their August meeting (postponed due to Ted Kennedy's funeral): public comments on the issues the group is charged with examining. 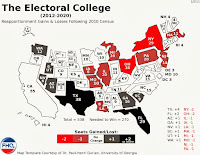 "Curtis Gans, Director of the Study of the American Electorate at American University made a presentation. He criticized the 1988 Super Tuesday Southern primary for starting the race to early primaries; this resulted in a process based on “state selfishness.” It is more important to select the best person to be president than for a state to get more attention. He recommended a bipartisan, durable system with less frontloading and less moving around. He recommended starting with smaller, diverse, individual primaries, and a spread-out process – not regional primaries. Regional primaries may result in different candidates representing different regions and split the party. He opposes a rotation where it all changes every four years. He favors a long process which worked this year, allowing candidates flexibility to skip certain states, 20-day filing deadlines to allow new candidates to file. Spread out individual primaries will encourage grassroots and discourage negative campaigning – if you have 20 primaries on one day, you need to rely on negative TV. He would prefer to start the whole process in March, but is okay with IA, NH, SC, and NV going early — it worked well in 2008. In response to a question from Jeff Berman, he stated that there is an opportunity for cooperation with RNC in setting calendar and the GOP is likely to agree on starting date." "Hon. Dan Blue (Comm. Member, NC State Senator) – late primaries can be good. In 2008, NC linked the presidential primary with state office primaries, the late primary got a lot of attention, and Obama and Democratic candidates won in November. Grouping of 29 states on the same day is crazy – you need to break it up, spread out process." Gans is right to blame 1988, but the idea of a Southern primary movement had its origins in the mid-1970s and was actually begun when Georgia and Alabama moved to coincide with Florida in 1980 (at the Carter administration’s behest). At the time, New Hampshire and Massachusetts were early and gave Kennedy a potential leg up in the race. So, it didn’t actually start off as state selfishness so much as the administration’s need to regain the 1980 nomination. By 1988, when the other Southern states moved, that had morphed into state (or regional really) selfishness. The proposals are nice to see and it is great to idealize what happened a year ago, but I still don’t see any incentive structure to get any of the bloc of early states to move back in the process. The bonus delegate regime has not been effective and the winner-take-all proposal for later states is flawed. Bipartisanship would help, but both parties have to stand unified behind any plan they construct together. "My thoughts: The most important point re timing is that the DNC (even with the RNC) does not have the power to set a single primary date and is not writing on a blank slate. State legislatures set primary schedules and proposed changes need to account for political realities – like IA and NH are going to go first. Thus I believe that a rotating process, consisting of changing dates in every state every four years is a non-starter. Super regional primaries, that don’t change, do run the risk of favoring candidates from certain regions (although famously this was not the case in the 1988 Super Tuesday Southern primary). Mini-regional primaries, like last year’s Potomac Primary (VA, DC, MD), allow campaigns to focus their resources and states should consider such groupings. As to the basic schedule – a long term process, starting in March for most states (with the now traditional early states of IA, NH, SC, and NV going after Feb. 1) makes sense. Spreading out primaries, using bonus delegates, as was the case with NC and other states this year also allows for a full vetting of candidates and should result in a better choice." Exactly right. Regional primaries are simply just a no-go from a state legislative standpoint. It is inherently unfair because both parties don't always have contested nomination races every year. As a result, some segment of the primary electorate on one or both sides of the partisan aisle may miss out on having an impact on their party's nomination when their state gets to go early. That alone will pit Democratic-controlled state legislatures against Republican-controlled ones. Again though, to think of and idealize the North Carolinas and Pennsylvanias and Indianas just because they lucked out and happened to have a protracted battle fall into their laps, doesn't mean that it is possible to make states go later (or at the very best to incentivize them doing so). That assumes that the Clinton-Obama nomination race is the new normal. It could be, but I doubt it. There's a lot of talk about the bonus delegate system and how North Carolina benefited from it in 2008. Yes, they gained, but only because they had a higher barrier to frontloading than other states had. If the Tarheel state did not hold its primaries for state and local offices on the same date as their presidential primary, they likely would have moved as well. But moving from the North Carolina General Assembly meant more than just moving to an earlier date; it meant funding an all new election (for the presidential primary) or moving everything else up. The latter is seen as a negative because that would affect turnout in down-ballot primaries in which the legislators themselves are involved (see Atkeson and Maestas). "Note – It was claimed that most states have presidential and state primaries on the same day, but it’s not clear that this is true and certainly hasn’t been true in Virginia." 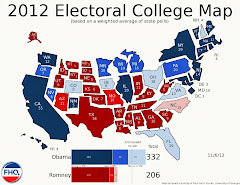 Most states DO NOT have their state and local primaries in conjunction with their presidential primaries. That is the main reason that most of the states that have moved over the years have been able to do so. I catch a lot of flack for being a negative nellie and shooting down all these ideas. That really isn't the case. I've made a career of looking at the unintended consequences of rules changes to the presidential primary process. My main argument has always been that if you are going to make reforms you absolutely have to take into consideration all of the potential unintended consequences. Otherwise, there is a risk that the reform measures just make things worse. Besides, from a Democratic perspective, the system did just work rather effectively. Obama is in the White House. [Well, some may have preferred having a Clinton in the White House.] Granted, it has worked well from a GOP perspective in the past as well. I think the proposals to spread the calendar out are the right way to go, but there just has not been an effective incentive structure proposed that would offset the state-level desire to move forward on the calendar. The first step in getting to that point, in my opinion, is have both parties work together to create a unified reform. Without that, states will continue to have the ability to pit the two parties' rule structures against each other as a means of maintaining the status quo. 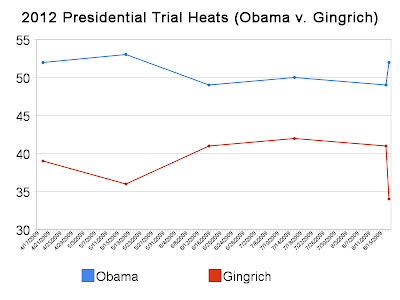 For the last few months FHQ has been pointing to an interesting trend in the (admittedly very) early presidential general election trial heats for 2012. * Sarah Palin is faring worse or worst among women against Obama than are her male counterparts (among the small list of prospective Republicans who have been polled against Obama with 2012 in mind). This is curious. There have been pronounced gender differences in vote choice that has varied since around the 1980 election. More often than not this appears in the form of women supporting Democratic candidates while male votes opt for the Republican alternatives. That partisan angle has certainly been debated within the political science literature, though. Chaney, Alvarez and Nagler (1998--gated), for instance, found evidence that this was not solely a partisan divide but an incumbent/anti-incumbent divide with women being more likely to vote against an incumbent. But we certainly hear more about the fluctuations from presidential election to presidential election in partisan terms: how the gap was lower in 2004 because of so-called "security moms"** and greater again in 2008. Regardless, the gap puts the Republican Party at something of a disadvantage in some elections more than others. One way the party could hypothetically combat the issue is to run female candidates. Now, we've certainly seen more of this in down-ballot races as opposed to presidential contests. After all, Sarah Palin was just the second woman on a presidential ticket in 2008 and the first Republican. But there's a problem there and McCain campaign manager, Rick Davis, picked up on this. He bemoaned the lack of women running within the party in his comments here at Wake Forest a couple of weeks ago. Still, the expectation is that if Republicans are able to run women, they'll be able to reduce the, what I'm calling here, total gender deficit*** to some extent (depending upon the gender of their opponent and other state level or national factors). 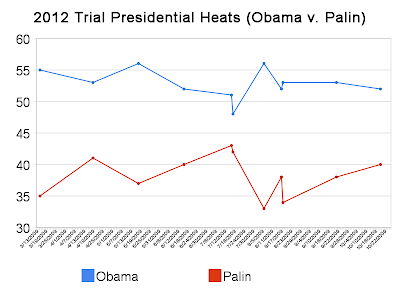 But that hasn't been the case in the 2012 presidential general election polling to date. 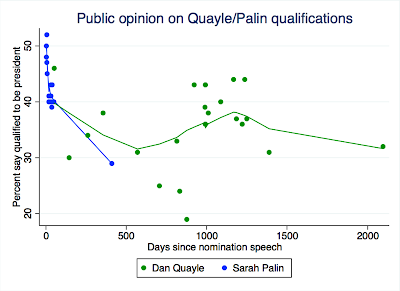 Sarah Palin has, again, done worse with women against Obama than have her male counterparts. ...and Romney on the the other. We can set Tim Pawlenty to the side for the moment. He just isn't a known quantity at this point in the game and that really affects his numbers among both women and men. 20% of each responded "not sure" when he was polled against Obama. [But who am I to deprive you of a glance at the figure?] So, let's consider Palin against Huckabee and Romney. The real discrepancy between them isn't the support among women, but that Romney and Huckabee are tied or slightly ahead among men, while Palin lags. Palin is in the same ballpark as Romney and Huckabee against Obama among women (They are all within 5 points of each other. ), but again, the surprising thing is that she isn't doing MUCH better with that demographic. And while still in the same vicinity of Romney and Huckabee, she is still bringing up the rear with women voters. Of course, when we consider the gender gap as it is traditionally measured -- the distance between the winning candidate's share of the vote among men and women -- Palin doesn't do all that poorly. 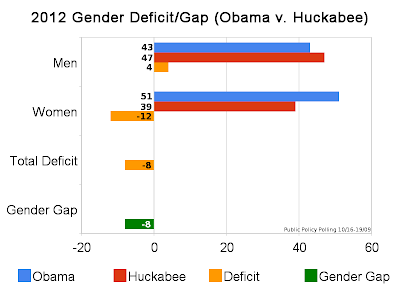 In fact, she ties with Mitt Romney for having the lowest gender gap, while Mike Huckabee maintains the largest gap. The former Arkansas governor's gap is largely attributable to the fact that he loses to Obama with women but beats the president with men. In the end, the difference between Sarah Palin (new vice presidential nominee) 2008 and Sarah Palin (ex-Alaska governor) 2009 among women is the difference between night and day. She has gone from making a huge difference for the McCain campaign with women (again, see Rick Davis' comments) to trailing among the demographic in hypothetical 2012 match ups with her at the top of the ticket. UPDATE: Jack raises a great point in the comments. These numbers are a bit quirky because the expectation is that the GOP advantage among men would offset the advantage Democrats have with women. 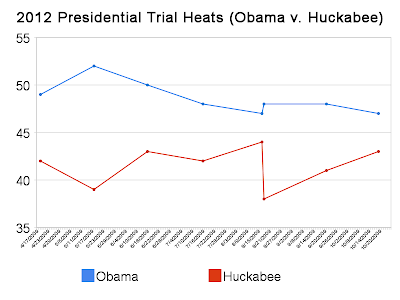 Here, though, only Huckabee is ahead among men. What that means is that there is something of a line to be drawn between the traditional gender gap and what I'm calling the total gender gap here. In this case, it should probably be called the total gender deficit. 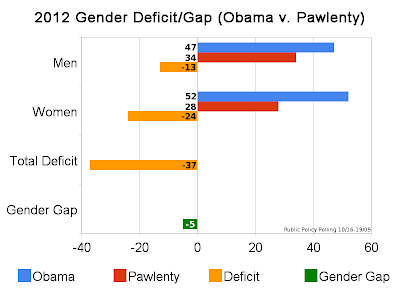 Here's a more traditional gender gap picture from Gallup in February 2008: a classic McCain vs. Clinton/Obama example. Obama and Clinton were relatively similar among women relative to McCain but the difference was in men. The way I'm calculating this deficit would have had Obama at -1 relative to McCain and Clinton at -9. To some extent this assumes that there is near equal parity between male and female voters in the electorate. I'll have to check on that. *Again, these are (way too) early polls, and we here at FHQ would normally hold off on putting too much stock in them. However, the consistency of this result in poll after poll leads us to believe there is something to it. **Of course, the security mom explanation was just one of convenience. There was little to no proof that members of that particular group weren't Bush supporters already. That the gender gap was smaller in 2000 and 2004 may indicate that women comprise many of the undecided swing voters that break evenly among the two major party candidates in a close election. ***The total gender deficit is calculated by adding the difference between President Obama and his prospective Republican opponents among men and women. While the traditional gender gap is relatively similar across the field of Republicans (within a range of 4 to 8 points), that doesn't give us an indication of the discrepancy between how much one gender group is offsetting the other between the parties. Looking at the exit polls from the 2008 election Obama won 56% of women to McCain's 43%. Meanwhile the president edged the Arizona senator by one point (49-48) among men. 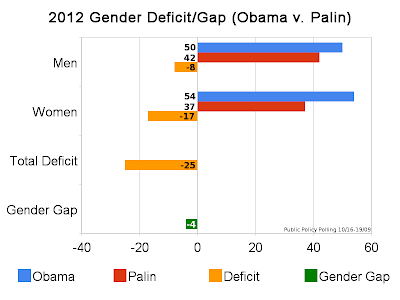 Obama, then, enjoyed a 7 point gender gap and a 14 point total gender deficit. Got 2010 Redistricting on the Brain?